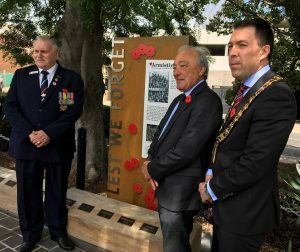 Lest We Forget: a new Armistice Centenary Memorial was unveiled in Mawson Park by Mayor George Brticevic, Macarthur MP Dr Mike Freelander and Campbelltown RSL sub branch vice president Warren Browning. Yesterday’s commemoration services to mark 100 years since the guns fell silent in the Great War were in effect a history offering to our young people. Primary and high school students played a major role both in preparations for the services and during the services themselves. Young people’s involvement dominated the main commemoration service held in the heart of Macarthur at Mawson Park, Campbelltown. Campbelltown RSL sub branch Warren Browning was the MC for the service, but mostly it was local students he called upon to perform a particular duty, from singing the national anthems of both New Zealand and ours – Minto Public – to explaining the history of what used to be called Armistice Day. Indeed students representing 20 local school participated in the ceremony to mark 100 years since the war ended and a peace treaty signed on November 11, 1918 – Remembrance Day. Thus Benjamin Nguyen and Gabriella Monteiro from Hurlstone Agricultural High School recited the Ode to Remembrance – we will remember them – while bugler Natalia Eagles from Campbelltown Performing Arts High sounded Last Post. A representative from each of the schools also laid a wreath at the Mawson Park cenotaph, a very moving part of the ceremony. 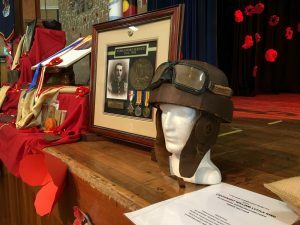 Encouraged by the federal government’s Armistice Centenary funding program local schools also had their own commemoration services on Friday morning. 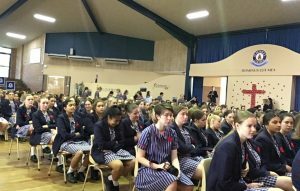 The history class of St Patrick’s College for Girls put on a comprehensive and detailed service that focused on local Anzacs, including relatives of some of the current students of the school. 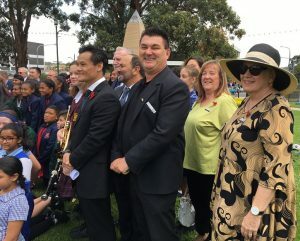 Campbelltown councillors and other dignitaries join the school children for a group photo in front of the cenotaph in Mawson Park yesterday as par of the Armistice Centenary commemoration. Moving letters from the front were read out and a speech by a serving member of the Australian Defence Force, Flight Lieutenant Brittany Lovett resonated with the students who had packed the school’s Mary Shiel centre. Fl Lt Lovett, who had attended St Patrick’s College, has just returned from a tour of Afghanistan. She told the story of meeting and getting to know an elderly Rat of Tobruk, who on being told that he was a hero protested, no, I am just an ordinary man. “But these men were heroes because they died for their country,’’ she said. If the idea of this year’s centenary commemorations was to make sure young people learned about the horrors of wars it worked brilliantly here in Macarthur. Not that it’s over – November 11 is tomorrow, Sunday, and there will be more reminders to young people to never forget what wars mean. As it is often said: those who forget history are doomed to repeat it. Part of the display in the Mary Shiel centre at the St Patrick’s college commemoration service yesterday morning.